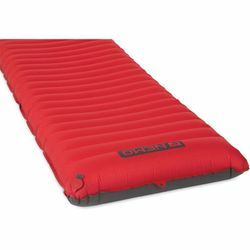 NEMO Cosmo 3D Insulated Sleeping Pad. The beloved Cosmo™, known for its durability and versatility, has an exciting updated profile for 2019. Now with 3D body-mapped baffles, the Cosmo™ 3D gently cradles the sleeper, keeping them centered on the pad so they don’t end up on the tent floor in the middle of the night. The slightly elevated head gives a chaise lounge effect and helps on uneven terrain. This is the first pad truly sculpted for maximum sleep comfort, and it includes our super-efficient foot pump for fast and simple inflation. Cosmo™ is updated with the Laylow™ zero-profile, multi-functional, micro-adjustable valve with fast deflation. Integrated foot pump is the fastest, easiest way to inflate your pad, and doesn't introduce moisture into the pad. New Laylow™ zero-profile, multi-functional, micro-adjustable valve for customizable comfort and fast deflation. Pillow Baffle™ keeps your pillow in place and adds loft at the head.